What on Earth is going on with our diet? I’m aware I’m beginning to sound like a stuck record but really, when are things really going to change? I am actually fed up to my back teeth with cheap offers for junk food. Literally every where I go, fast food, take-aways and chocolate are shoved under my nose. I popped into Iceland this morning to pick up some milk and I am presented with an offer of 600g of chocolate for 3 quid (see the headline photo) as soon as I walk in. I have previously ranted and campaigned about junk food at the checkouts but actually the entrance way is equally challenging. Having to wade past the towers of cakes, biscuits, chocolate eggs and grab bags sets off your shopping trip on completely the wrong foot. 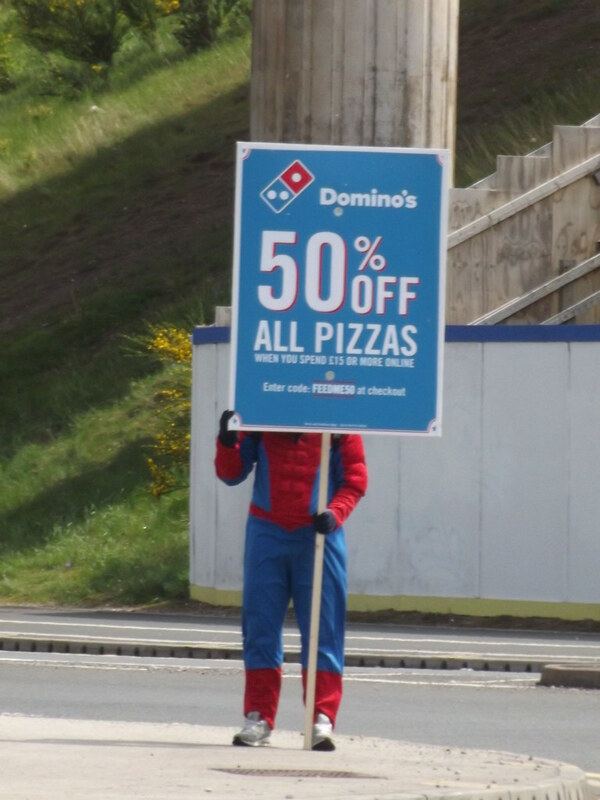 Every weekday morning I see Spiderman with an advertising board (most often in the freezing cold) standing on a round-a-bout promoting a devilish Domino’s pizza deal and it’s not even 10 am. What’s that about?! At least 5 days a week I get a flier through my letterbox; Subway, Domino’s, Pizza Hut and a selection from my local Chinese and Indian restaurants land on my mat. And to be honest I don’t even look at 99% of them. They go straight in the bin, what a waste. The British takeaway market is worth over £5.5bn and has grown massively over the last 4 years. Just Eat and Hungry House have certainly taken the market share but due to consumer demand and the growth of the app market, other companies are starting to muscle in. I get that convenience food has its place. We can all benefit from a helping hand at times but this hand is starting to linger like a bad smell. In the states, around 6% of the population will be eating takeout at anyone time. The principle of it is great. The problems are that we rely on it way too much and of course the majority of foods are sky high in salt, fat and sugar. So the icing on the cake this week has been hearing McDonalds might be bringing a home delivery service to Birmingham. The city where there are more McDonald’s restaurants than any other UK city outside of London. Just fantastic. Where Dudley already has the award for the most unhealthy place to live. Closely followed by Walsall, Wolverhampton and Birmingham. Dudley boasts a staggering 10 McDonald’s restaurants per 100,000 people, with just 3 gyms. Compare that to Bristol, the healthiest town that has 234 cycle routes 45 sports clubs and just 2 McDonalds per 100,000 people. No wonder we have one of the highest rates of diabetes, heart disease and obesity in the West Midlands. So my issue is this. How is the general public ever supposed to win? Most food producers and food outlets monopolise our communities. Every week a new gimmicky eatery opens on our high street, like this cereal cafe. The Government is weak and in my opinion has done too little too late. The financial incentives to stand up to the food industry are simply not there. How long did it take for the sugar tax to come about? And with it only applicable to soft drinks, surely the impact will be limited. The responsibility deal seems no more, not that is really made much difference because there was always the option to opt out. Reports show we want healthier food these days. We are learning the importance of the nutritional value of food and links to disease but finding and purchasing the healthier product is often too hard. Our good intentions and efforts to eat healthily are constantly undermined everywhere we turn. So our healthcare service has to carry the burden, there is no comeback whatsoever on the big food giants and they have us hooked. I genuinely feel scared for the future unless somehow we can weaken their stronghold and for that to happen, big decisions and huge action must be taken. We have to limit their influence (the offers at least!!) and control over our food environment. I know it’s complicated and needs an incredible amount of joined up thinking but come on Jeremy Hunt, what’s next?